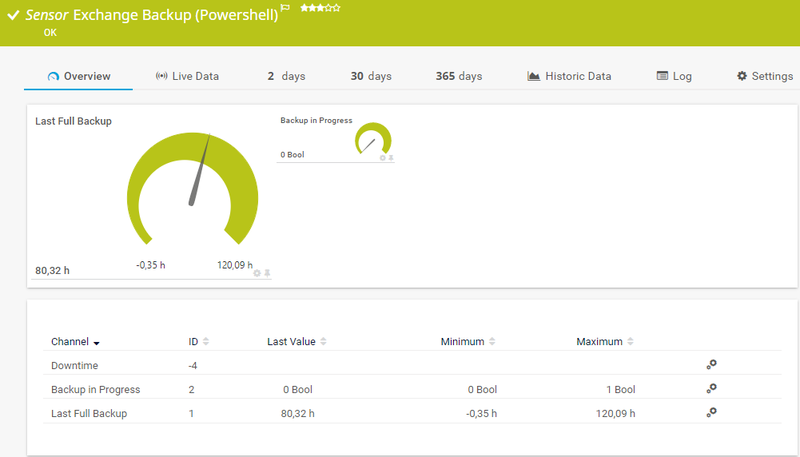 The Exchange Backup (Powershell) sensor monitors backups of an Exchange server using Remote PowerShell. The parent device for this sensor must be the Exchange server (version 2010 or higher) that hosts the database you want to monitor. Requires Remote PowerShell and Remote Exchange Management Shell on the target servers and PowerShell 2.0 on the probe system. Requires the FQDN of the Exchange server in the parent device settings. Requires .NET 4.0 or higher on the probe system. This sensor type uses PowerShell commands. To monitor Exchange servers with this sensor, you have to enable Remote PowerShell and Remote Exchange Management Shell on the target servers which you want to monitor. Also ensure you have installed PowerShell 2.0 or later on your probe machine. Note: In larger environments, the default memory limit for the remote shell might be insufficient and you might see the error message "The WSMan provider host process did not return a proper response". In this case, increase the memory limit for Remote PowerShell. For more information, please see the Knowledge Base article http://kb.paessler.com/en/topic/44453 (see also section More below). To connect to Exchange servers, this sensor type needs the fully qualified domain name (FQDN). In PRTG's device settings of the Exchange server, provide the FQDN instead of the IP address. For more information, please see the Knowledge Base article http://kb.paessler.com/en/topic/54353 (see also section More below). This sensor type requires the Microsoft .NET Framework to be installed on the computer running the PRTG probe: Either on the local system (on every node, if on a cluster probe), or on the system running the remote probe. If the framework is missing, you cannot create this sensor. Required .NET version (with latest updates): .NET 4.0 (Client Profile is sufficient), .NET 4.5, or .NET 4.6. For more information, please see the Knowledge Base article http://kb.paessler.com/en/topic/60543 (see also section More below). Select the Exchange server databases you want to monitor. PRTG creates one sensor for each database you choose in the Add Sensor dialog. The settings you choose in this dialog are valid for all of the sensors that are created. Select the databases you want to add a sensor for. You see a list with the names of all items which are available to monitor. Select the desired items by adding check marks in front of the respective lines. PRTG creates one sensor for each selection. You can also select and deselect all items by using the check box in the table head. Shows the name of the monitored database. Once a sensor is created, you cannot change this value. It is shown for reference purposes only. If you need to change this, please add the sensor anew.